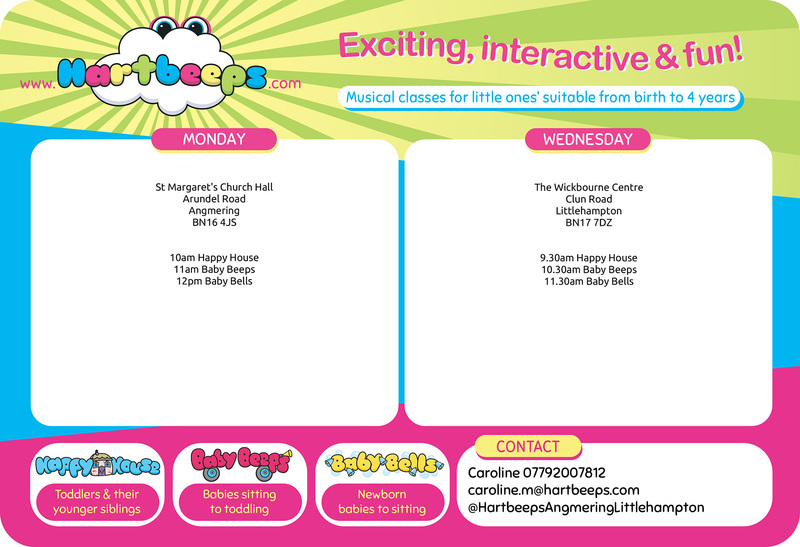 All babies under 8 weeks can join a Baby Bells class in Angmering for FREE!!! Come and join our gentle, nurturing Baby Bells class, focusing on bonding and confidence, with your new baby and don't pay a penny until they turn 8 weeks. I'm Caroline, Owner and Chief Imaginator at Hartbeeps Angmering & Littlehampton. I first fell in love with Hartbeeps as a customer, attending local classes with my baby daughter. Not long after, the opportunity arose to begin my own business running a Hartbeeps franchise. I couldn't think of any better job in the whole world. I adore bringing that magic to little ones and their grown ups. Giving families the opportunity to bond and develop together. Watching babies and children coming out of their shells, their stunning personalities beginning to shine, the pride and joy reflected in their grown-up's faces. Three years on and there is still no better job in the whole world. So come and join me in our Hartbeeps world of imagination. Dive down the rabbit hole with your little one and let us take you on a magical sound journey to a place of adventure and excitement where we learn through play and creativity, all set to an amazing soundtrack and bound together with sensory magic. BOOKING IS OPEN for this term, starting on Monday 22nd April, running through to Friday 19th July. Read the latest newsletter for exciting news on what's coming up. Spaces are limited so book your space now to save 10% on the drop in price and guarantee a place for you and your little one. To book, either contact me directly to pay by BACS, or click on the relevant link to booking system below. Littlehampton continues to be pay as you go on a drop in only basis at £3 per family.